Excellentte Consultancy Sdn. Bhd. was established since 1997. It was founded by Alfred Sek who has more than 30 years of experience in the financial services industry and pioneered the financial planning industry in Malaysia. He is also the former President of the Association of Financial Adviser (AFA) Malaysia. 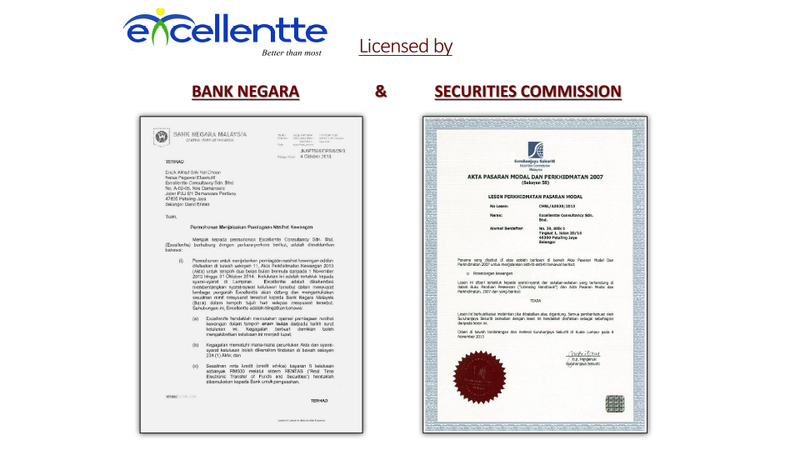 Excellentte Consultancy is a Financial Adviser firm licensed by both Bank Negara and Securities Commission Malaysia. At Excellentte Consultancy, it is our aim to deliver professional and comprehensive financial services to our clients. Our value proposition is to represent clients interest in looking for the best financial solutions. To be the most Professional, Productive and Profitable financial consultancy company in Malaysia. To provide professional advice on a wide range of financial products to fulfill consumers’ dreams. Compliance to both Bank Negara and Securities Commission Malaysia regulations and guidelines.